In an earlier article I wrote about perceptions in photography. Minor changes in how you take a picture, such as shooting from a different angle or pulling in close on your subject, can change what is portrayed by the photograph. Changing a photo from color to black and white can also have this same impact. Each of these changes can make your pictures tell a totally different story. First, please realize that every picture tells a story. The key is making sure that your photograph tells the story that you have in mind. Of course this can be pretty subjective too because an identical image can mean different things to different people. Since I can’t possibly predict if others see the same things that I do, I really have to go with my own perceptions. My goal is to portray a specific feeling with every photograph. I want people to imagine actually being there, seeing what I see in my mind. Does the picture tell the story that I want it to tell? While working on a story centered around a small southern town. I was having some trouble getting the right shot that would begin to tell the story for me, before my visitors read even a single word. This one shot seems to capture the spirit of this little town. While the picture has no specific focus, in the background you see a Southern Baptist church standing tall and proud. 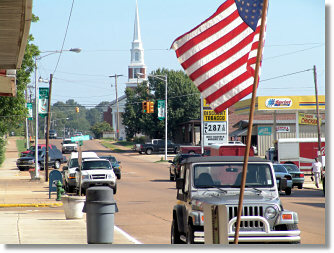 In the forefront of the image, you see clean streets, a United States flag, a discount tobacco sign, the hint of a Coca-Cola truck, and the town’s primary traffic signals. Even the trash can and the number of pickup trucks in comparison to cars had a role in the story. I really felt I had a good shot, but for me, something was still missing. I pulled the photo into my image editor and decided to apply a filter that would convert it to a black and white image. For me, it was the perfect finishing touches for the shot. Others may prefer the photo in full color. Click the thumbnail photos above so you can view the full size pictures. See if you think they tell you a story about the spirit of a tiny little town deep in the south.